Some (not very good) pictures from the final battle at Warhammer World. 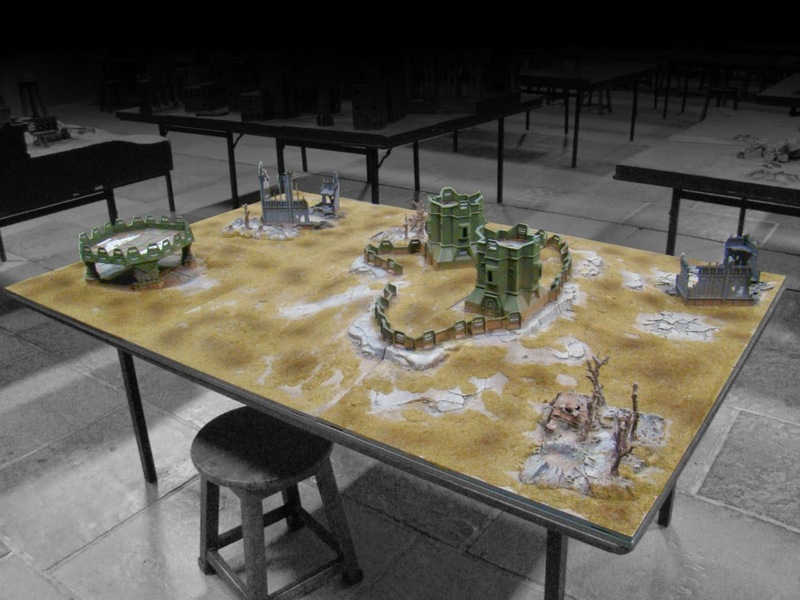 these were taken during the final battle of the weekend, on the Doom of Gorgon table. It was a great battle & pretty close! My friend and I had decided that we wanted to get as many as our models on to a table as possible. 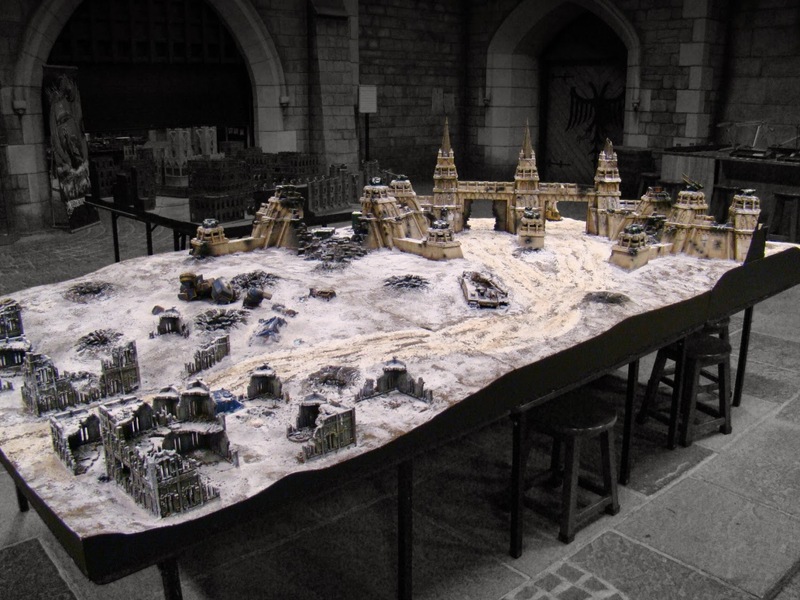 With this in mind we booked the Fort Pain 12ft x 6ft gaming table. As you can see below the scenery and level of detail is stunning. It was a privilege to play on such a board! In the 2nd part of my Warhammer World series I wanted to show off the Space Wolves v Tyranids diarama which is currently on display in the Hall of Miniatures. Its fooking awesome! Over the weekend of 26th July a friend and I visited Warhammer World in Nottingham for a weekend of dice rolling and catching up. Over the coming week I will be making 3 or 4 posts about various aspects of the trip. Needless to say we had a great time; rolled many dice, drunk a couple of beers and generally had a rather spiffing time! I'm heading over to Warhammer World this weekend and in preparation I have been varnishing and weathering my troops. Alongside that activity I have been casually working on one of the awesome Legion Praetors which I picked up a few months back. So tonight I got to play my first game of 40K using Vassal. What is Vassal? Well, Vassal is a game engine for building and playing online adaptations of board games and card games... including 40K. After spending about 45 minutes figuring out how to use the engine, Bob and I played a small game on a pre made board. I have to say it was pretty slick! very quick to use once you get used to it and ideal for hobbyists like us who live hundreds of miles away from each other. 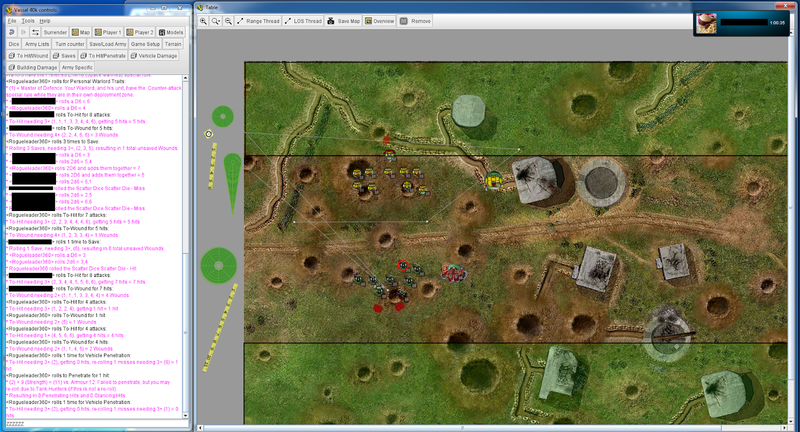 Above is a screenshot of the interface, taken early in our first battle you can see that things are pretty even between our small forces. After some devastating combat my Imperial Fist force came out on top (not that it matter for such a practice game). Anyway, I would seriously recommend checking out Vassal; it's awesome! After recently completing my Imperial Knight, and after a busy June, I am taking the chance to have a break from hobbying. I will be heading to Warhammer World in a couple of weeks for a boys weekend of beer, herecy and rolling dice but until then I doubt I will do much to expand my collection of painted Space Marines. Here is a picture of my progress so far. Considering I started in December 2013, I'm really happy with the army I am now able to present. So it has taken a while, most of June in fact, but I have finally completed my Imperial Knight. I'm really happy with how he has turned out however I strongly believe that the model is of such a high quality that its much more difficult to do a bad job than a good job. I'm really happy that I decided to go with a colour scheme which links the unit to my Space Marine chapter and will post a photo of all my units together in the coming days.... then its on to a Contemptor Dreadnought. WIP4: Imperial Knight - Chest & Head Done! Nearly there! Head and chest sections now complete. Only the top armour section to go. Thus model has been an absolute pleasure to paint! WIP4: Imperial Knight - Weapons & Shoulder Plates Done! He is starting to come together! As you can see, the weapons and shoulder plates are now complete. I'm really happy with the standard of the painting that I've managed to achieve on this unit so far... however I'm a bit annoyed with how the decals have turned out on the shoulder plates. As you can see in the photos, the Aquilla's have tiny folds in the transparent sections. I will try and flatten these out with a craft knife, and the visual impact isn't deal breaking (from a distance) but it has dampened my satisfaction with the model. Next up will be the chest piece and head. WIP3: Imperial Knight - Legs Done! Its taken me a week or short, but often painting sessions to complete the lower section of my Imperial Knight. Not much to really say as I've uploaded a few photos of where I currently am at with the model. I think I will focus on the weapons next, then the shoulder pads and finally the main torso and top armour plate. Enjoy! So, after seeing the below photo on Facebook I became intrigued with the idea of painting my Knight in my Space Marine chapter colours. Originally I wasn't a fan of this idea due to fluff reasons, however, the visual impression that the below photo had on me led me to question my choice. After lots of pondering I came up with a plan to pacify the fluff monkey in my head! Some background info - my Marine chapter takes its name from the gaming community which I create and built over 4 years (Light Knights) until I moved away from PC/console gaming last year. I dreamt up the idea of creating the chapter whilst still part of the community and I had envisioned creating characters within the chapter based on prominent members of the community. My Lysander is the representation of me and is called Oane (my 'main' character name in MMOs). In order to link a noble Knightly house to my chapter I decided to create House Runninglight (this being Oanes family name). Very nerds and rather obscure I know; but these are the subtleties to the hobby which a lot of us love. So yeah, I am now painting the Knight in my marine chapter colours along with some funky hazard lines and the addition of deep red armour sections for the Imperial Aquilla. He is coming along great and cant wait to show you guys more! This epic bad boy has been sitting on my shelf for what seems like an eternity! After I used the painting of the Hunter/Stalker (a Christmas Present from my awesome other half) as motivation to spur me on with the completion of my older unpainted models, the Imperial Knight became a further incentive as I promised myself that once the Hunter/Stalker was finished I could move on to this model. As you can see, I have been working on the Skeleton of the Knight. Using the airbrush I was able to coat the model in a fraction of the time it would have taken to paint it using a brush. After watching the very good 4 part guide on how to build, paint and apply transfers to an Imperial Knight over on the GW YouTube page I decided to paint my Knight in the colours of House Taranis. Whilst this paint scheme does not include any hazard lines (which I was preparing myself for having to paint), I do like the overall colour scheme as it doesn't feel overly intricate and is focused around colours which are not part of my Space Marine colour scheme. So I recently had to attend a meeting in London and had some free time afterwards. What better than to sample some beers and visit some of the GW stores in central London! My first port of call was the GW store in Covent Garden. This is probably the most unique GW store I have visited! It's pretty small, being built in the basement of the Victorian Covent Garden Market. It had a good selection of products but had (maybe not surprisingly) sold out of White Dwarf (the pre 7th Ed edition). Next up (on my hunt for White Dwarf) was a trip over to the Oxford Road store. By this point in the afternoon I had consumed a *few* ales but still managed to locate the store without any problems- even though it was hidden in a rather faceless shopping arcade (mall). This store was much bigger; with some awesome gaming tables (see below) and of course very helpful staff on hand. Thank fully they had some copies of White Dwarf left! Mission Accomplished!! Unfortunately by the time I had gained possession of White Dwarf, I had 5 pints inside me and had been walking around London for hours... so the White Dwarf was placed in my bad and didn't get looked until the following day. So I recently went on a bloody awesome holiday to Barcelona. Being the true nerd that I am, a trip to the local GW was on my list of things to go... along side visiting the Nou Camp & La Sagrada Familia. After roaming the streets for hours we finally happened upon the store located in central Barcelona. I have to say that it was pretty descent! Loads of room, a good few tables and a great selection of products. Whilst there I bought the obligatory paint and, randomly, a Land Speeder Storm. Big thanks to my other half who willingly allowed me to drag her around Barcelona on the penultimate day of our holiday just so her man-boy could get his nerd out. Just because its so awesome, here are some pics from inside La Sagrada Familia. Last December a friend and I met up at Warhammer World for a day of gaming. He lives in the north of England and I live in the south west so Nottingham is more or less half way for us so is perfect for when we can get weekend passes from our other halves to go and play with our toy soldiers. Having just had our table bookings confirmed for the end of July I am very excited to our next visit. This time we are planning to play games on both a Saturday and Sunday and we're aiming to go BIG. For the Saturday we've booked the daddy, Fort Pain, weighing in at 12 x 6 this board is the daddy. 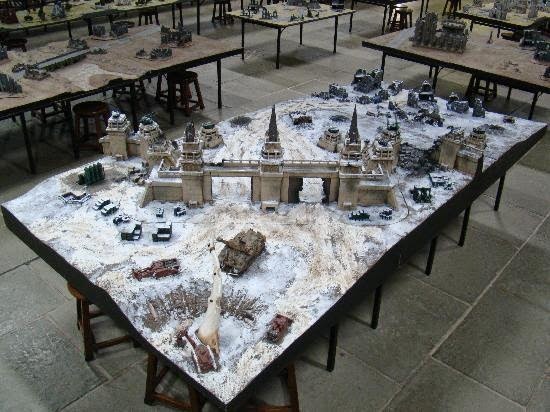 We are going to aim for (after a warm up game or two) a 5000 point battle to take full advantage of the board. 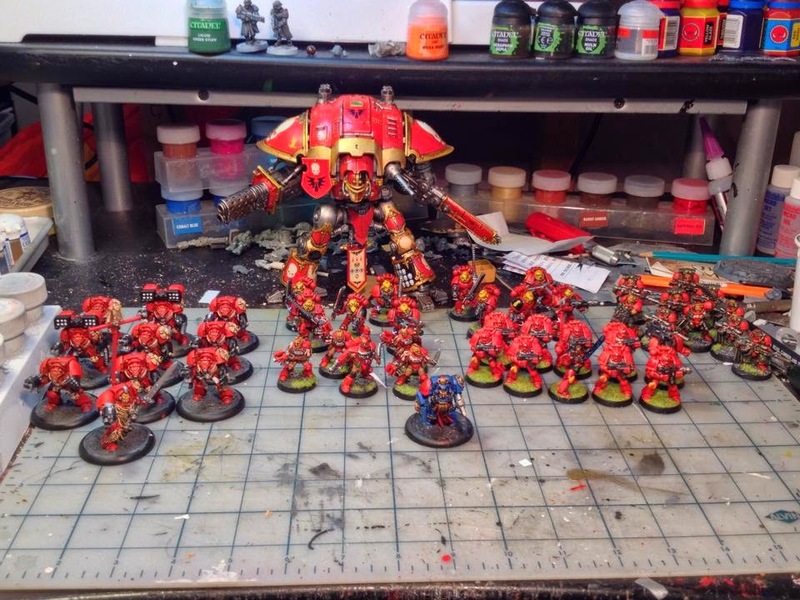 This will literally involved all my models, whether painted or not and my friend will need to assist my force with the donation of his Grey Knights and Imperial Knight. When I saw this table during our previous visit I fell in love with it and am very excited about being able to play on it. Warhammer World is open to 10PM on a Saturday so our plan is to game into the evening, having our lunch and dinner at Bugmans Bar... oh and a few pints of ale as well! For the Sunday we have booked the smaller, but modular, Doom of Gorgon table. This is a normal 6 x 4 board using the Realm of Battle pieces. I'm really looking forward to playing some smaller games (compared to the 5k mayhem) on a more relaxed Sunday. Now that the weekend has been booked I have a deadline to get as many models painted as possible. I have a plan and will do my best to get as much done as possible. With the Emperors guidance I'll complete my goals and allow my friend and I to play some epic games with fully painted armies. Game on! So after finishing my final troops choice I figured I should get all my painted models out to see what my force looks like on the table. My completed units total up to around 2400 points! Not bad progress for under 6 months of work. I still have lots to of models to work through, however, I am not far off being able to field a fully painted army based on the real world army lists which I have been drawing up. Happy days! Following on from the Devastator Centurions, next up is the Command Squad which Bob gave me as part of his Space Marine donation at the beginning of last year. I painted this unit in a slightly different manner to my previous Space Marine troops in that I used my airbrush: I had been a bit concerned that I wouldn't be able to take full advantage of the Airbrush whilst working on this army. Thankfully I was wrong! Using the Airbrush to paint the base coat and first highlighted layer I was able to further highlight the armour and for the result to maintain the look of the my previously painted units. I spent a lot of time focusing on the details on this unit; adding a Grey Knight helmet, a demon head and some other little bits and pieces to add a more unique feel to the squad. Below you can see pics of each individual member of the unit. The Standard Bearer has a Grey Knight helmet and I used the masking tape method to help achieve straight lines on the banner. With the added Grey Knights helmet I think this guy looks pretty awesome!. On this model I replaced his left hand with one holding a severed Demons head. I also added a Grey Knight sword. During painting I added some Blood For The Blood God technical paint to the sword, head and also some drops on to the base/marines shoes to simulate the blood from the vanquished demon. And here are the 3 remaining members of the squad. I'm very happy with how this squad has come out: I painted them in under a week (which is good going for me!). I don't know whether the unit will be included in any of my army lists however its an interesting unit and another section of my unpainted army finished off. On to my 3rd Tactical Squad!